Things we did today...: Boat Projects - AC Raw Water Cooling System - CHECK! Boat Projects - AC Raw Water Cooling System - CHECK! We bought Dos Libras over a year ago and have had one AC unit replaced. Both units work off a single water pump which draws water in via a through hull and pumps it to the units to cool the compressors. The water then exits through two through hulls just above the waterline. Bruce has been plagued by the fact that one hole seems to gush water, while the other barely trickles. He has investigated all the hoses and used air to blow through each to make sure that they aren't plugged but still, it just trickles. This is one of the many projects that were put off until after my retirement so that I could be here to help out. Today, we plunged in! The problem seemed to be this "T" fitting where the water comes from the pump and is distributed to each AC unit. It is situated behind the engine and underneath the aft shower floor. 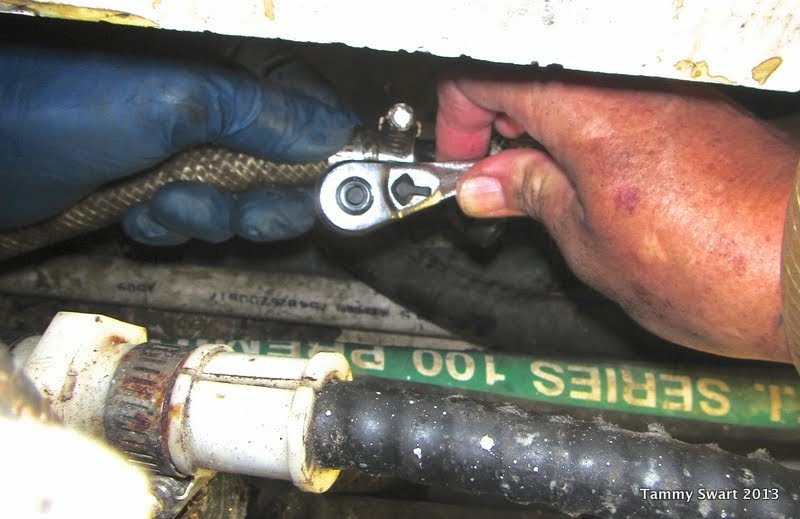 We think that there may be gunk caught in the fitting and since the water is forced through a 90° turn, it might be less efficient than we would like. We ordered a "Y" fitting, finding only one in the world for 5/8" hose. With much grunting, sweating and letting of blood, Bruce and I tackled the fitting from both sides. I loosened the clamps while he held the hoses steady. Then I pulled from one side while he pulled and twisted from the other. We finally were able to get the fitting off the hoses and found our culprit. I can't believe any water at all was able to get through this fitting. 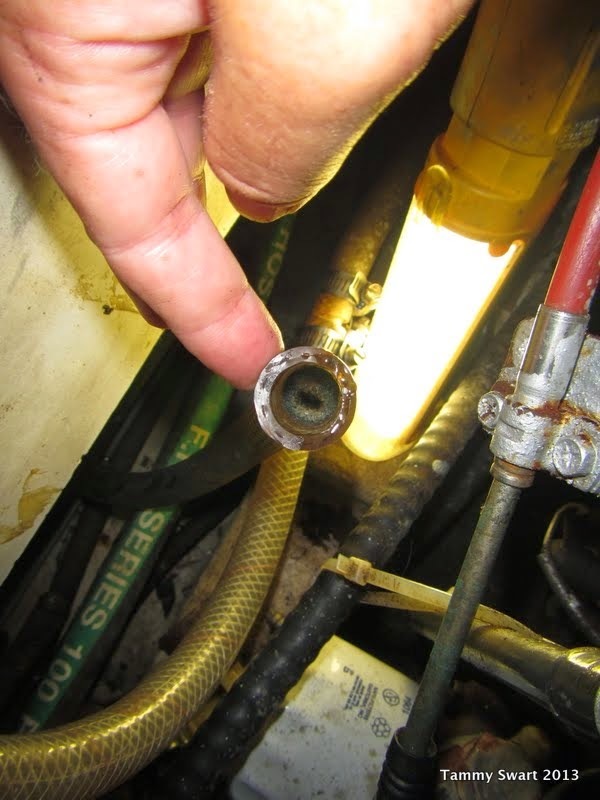 Upon further investigation, we found the hose going from this to the aft AC was pretty clogged as well. Bruce tried using the air compressor to blow it out, but we decided to just replace the hose with a new one. Luckily, we had some on hand. We used a straight splice fitting inside the ends of both the old and the new hose to secure them. Then we used duct tape wrapped around the outside to make sure they wouldn't part when we pulled the hose through. It was no sweat pulling the new hose through and luckily we had exactly the right length. Next, we reconnect it all. 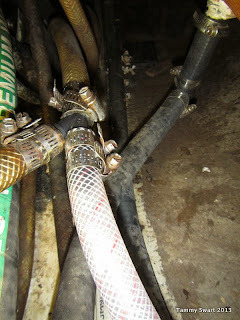 Bruce crawled into the hole and connected all three hoses with clamps to the new fitting. The new fitting had us running one hose from the opposite direction from which it originally came. Luck again would have it that there was enough hose there to allow a gentle curve and it went right on. Tight space with limited line of sight. The last thing we needed to do was to secure the hoses to the fitting with clamps. This took Bruce coming from one side with his left hand to hold and position the piece, and myself coming at it from the other side with my right hand and the ratchet to tighten the nuts. Not an easy task when you can only see what you're doing with one eye at a time! But, somehow we were able to get it all hooked up again. We turned the pump back on and there were no leaks at either worksite. YAY! A quick look over the side and we found water gushing happily from both exit holes! YAY again! I LOVE it when a plan comes together! We did all of this with the AC OFF and finished two hours from the start at 1:30 pm! It's HOT in here! I'm pretty sure I've never sweat this much in my life. But... we accomplished something and we're happy! One more thing checked off the to-do list! Ugh, we went through something similar a couple weeks ago. The shower sump in our forward cabin started whining and wouldn't pump water overboard. Hubby went to the local West Marine and bought a new pump. An hour later, turned it on and the same issue. What the hell? He then went outside and used the hose to shoot water into the through hull fitting. Sure enough; the hose was blocked somehow. So, now it's working and we have a backup pump! Marie, I would imagine that is how the majority of "backup" parts are acquired! This has me thinking that we need to take a look at ALL of our hoses. It is amazing how much gunk was in that line.